Portable storage offers a lot of solutions for many of your storage needs. These solutions are maximized by a number of benefits and the top seven are described below. Building supplies and raw materials, like lumber, cement blocks, paving stones, etc. As you can imagine, all of the above items are valuable and expensive and potentially dangerous -- depending on the purpose and material. Therein lies one of the primary and most important benefits of portable containers: security. In other words, it's serious protection from both potential thieves or unauthorized persons and the elements, like rain, snow, or wind. Portable storage offers state-of-the-art design using treated steel to resist rust, and also provides superior protection from wind and rain. Locking systems can also be utilized that have special hidden padlocks, so that unauthorized people can't access the lock or cut it off. 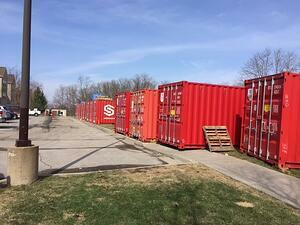 Portable storage containers are competitively priced, making them more affordable than leasing traditional storage units at a facility or leasing additional retail space with high rents. Plus, you only pay for what you use. If you need it for only one month, then that’s all you pay for. If you need it for a year, then that’s what you pay for. Likewise, if you intended to use it for 6 months but a project ended earlier than anticipated, you can usually stop using the unit without consequence because most companies do not require strict leases or contracts. Additionally, if your business is a construction business where you move from one location to another location relatively often and still require storage space, then purchasing a portable storage unit may be your most economical solution. Often you can lease to own or purchase a used or new portable container. It is good to make sure you know all your options and make the best decision on price. This is a benefit that maximizes the convenience of storage: your access to it. Accessibility materializes in two important ways: (1) control; and (2) productivity. As to the first, portable storage units are under your sole control; no one else can access them without authorization. Not only does this benefit increase security of the items stored in the unit, but it allows you to access the interior container whenever necessary and to control who else accesses the interior. For instance, during the day or during operations, if desired and for convenience, the unit can be open for everyone to easily access the contents inside, whether that’s machinery, tools, inventory, or other materials. But again, it can also remain locked for controlled access 24 hours a day / 7 days a week. As to the second, having the ability to access stored items on-site reduces the time lost to retrieving items from off-site locations. This is true whether you are in the construction, retail, or any other industry. The time no longer spent on retrieving stored items is time spent on your business, and that means higher productivity. Mobile storage units are transportable to just about anywhere. Companies will bring the empty container to you and pick up the empty container once you are finished with it. And, of course, if you've purchased a unit, you can take it anywhere you need it. Portable containers are in it for the long haul. They are very durable, and that’s both a benefit and a necessity. Mobile storage containers are highly versatile. Their intended purpose is usually storage. As storage units, they are often customizable with optional racks, shelving, ramps, and wall dividers. Wall dividers are particularly useful because it can transform your portable storage into a storage unit and office space, if needed. (Some companies even lease or sell mobile offices and office/storage combo units.) Furthermore, if you outgrow your portable storage container, it is easy to add another one and grow your storage space alongside growing your company. If you are a construction company, then you are likely aware that many jurisdictions where you work and build have strict regulations that must be followed or you will face consequences, like hefty fees and fines. Your insurance policy may also impose certain terms and conditions. These regulations or insurance policy terms often pertain to security for construction equipment and materials, especially dangerous materials. The basic reason for compliance with laws and insurance terms and conditions is simple: the safety and health of the public. If someone gains access to any potentially dangerous equipment or substances, then you could be at fault if the items were not secured accordingly and properly. The benefit of compliance brings us back around to security. Portable storage containers are highly securable and protected against theft as much as they are against the elements. With portable storage containers, you can rest assured you are likely in compliance with any jurisdiction-specific regulation and/or the terms and conditions of your insurance policy. If mobile storage sounds like the thing you would like to benefit from, then be sure to weigh your options. When the time comes to buy or lease, contact SiteBox Storage. We provide storage solutions throughout the Midwest, particularly Kansas, Oklahoma, Texas, and Missouri.